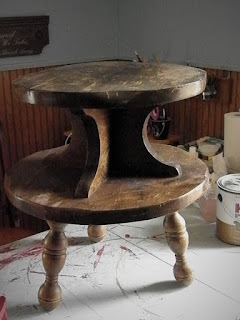 Over the past few years, in addition to making DIY Dog Mom Projects, we've spent a lot of time repurposing items and giving old wooden pieces makeovers. To name a few, in 2017, we repurposed our old entertainment stand into a combination nappy nook for the kids and TV stand. In 2017, we used 2 pieces of old barn wood to make a really cool DIY Dog Bed. Last year, we repurposed a mini wooden table into a luxury cat bed for a friend. We also repurposed a wooden chair into a small pet bed. Some, we offer as Up For Grab items. Some, we keep. Last month, we brought this accent table upstairs. I wanted to give it a makeover and offer it as an Up For Grabs item. I gave it a good cleaning and a couple of coats of Kilz Primer. A few days later, I painted it a gorgeous Honey Mist. Then, I added a simple stencil design on the top and gave it a coat of protective varnish. On Thursday, I posted it as an Up For Grabs item. It hasn't sold yet. Pieces like this are often hard to sell because we don't offer shipping on big pieces like this one. I'm not too disappointed that it hasn't sold because I really want this piece to go back to where it was before we put it in the basement. On the side of our sofa for an end table. No, our sofa didn't shrink. I'm actually in the process of giving the plant stand that was in the corner a makeover. We no longer need it for the living room. I'll be able to slide the sofa down about a foot. This accent table would look gorgeous in our living room. None of our rooms have a theme. Our décor is colorful, unique, and a lot of it are unique finds from flea markets and yard sales. I really love the look of old, unique pieces that are given makeovers with fresh coats of paint and simple detailing. One of the biggest reasons why is because they're one of a kind. Why buy something that is mass produced when you can make your own unique piece? 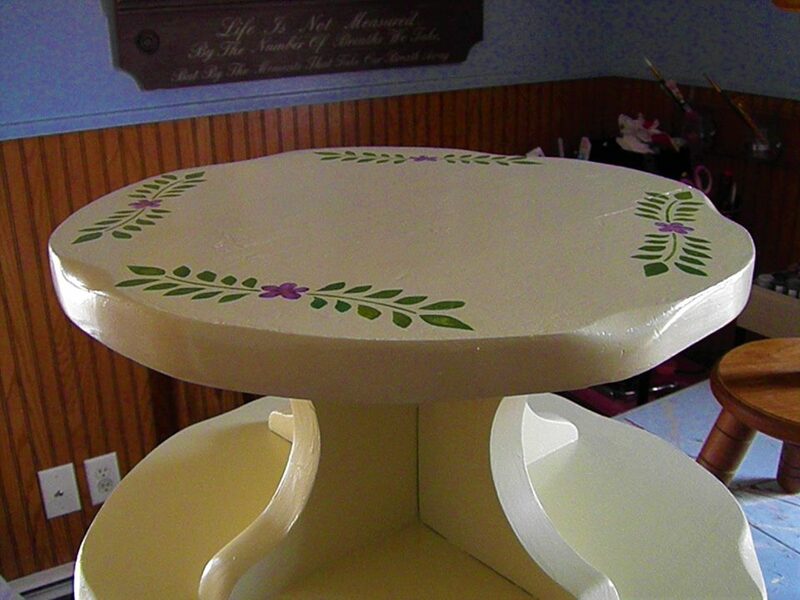 I'll be painting the plant stand with a little something more vibrant like Laguna or Teal. The detailing will be simple and fresh. If that doesn't sell, we've got the perfect spot in the kitchen for it. It'll be a pop of color to our already colorful kitchen.